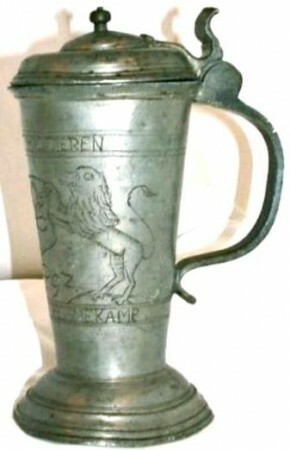 “Roerkens” are small “pilsner shaped” Northern German (mostly Baltic area) pewter drinking vessels, almost always associated with a Guild! 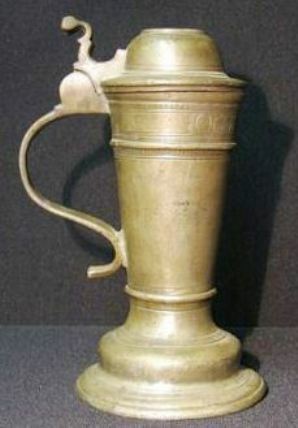 Why so high $$’s wise, for such a tiny stein? I will get to that and determine the reasons later in this article. But first, contrary to the way I usually show items on this web site, I will show several examples of this art form (and it is most definitely is a “form.”) These shown are all new, say within the last 50 years and made for personal use or display at a bar, etc. 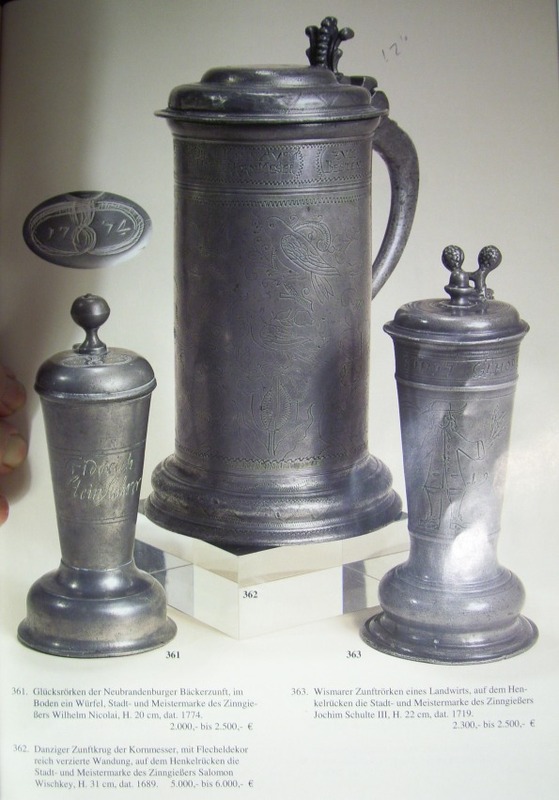 While most new beer stein collectors can not afford an $8,500.00 stein when they start, I think a grouping of these newer ones would make an interesting “sub-set” in one’s collection. Circa 1950 with staining and light engraving of something indistinct. 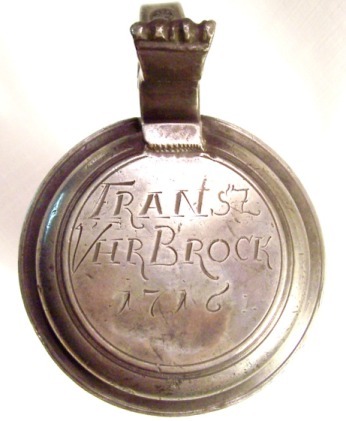 6 inches to top of lid which is dated (in the correct manner) “1701.” Indistinguishable marks on the bottom. A nice looking display piece. Around the same time period as above I think, 8.5 inch. Sold on eBay in 11 – 06 for $62.00. No info on marks. 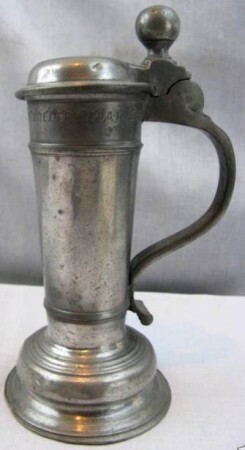 Marked “Reed and Barton” which is an American firm that made steins in silver, silver plate and pewter. 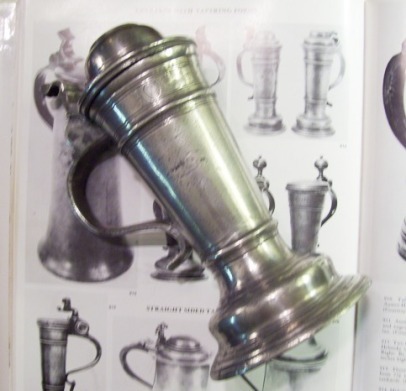 They also imported steins such as the one shown = a well made pewter “Roerken” made by F. Santesson in Stockholm. Stamped No. 245. Size is about a 3/4 liter. Another marked “Reed and Barton [#0227] but made by Santesson. 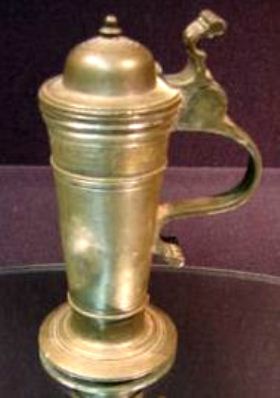 7.25 inches tall to lid. Circa 1900. The Coat of Arms (NOT A CREST!) of Norway is engraved on this body. 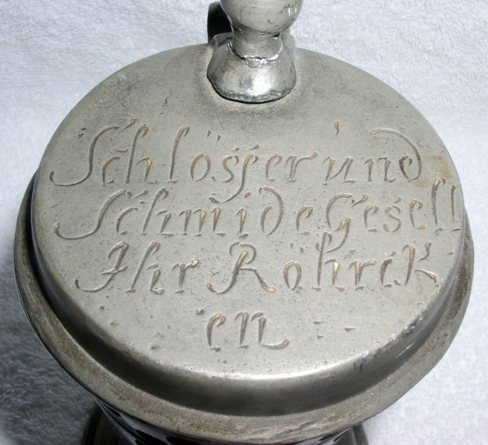 Engraved eight sided cross on lid. A very nice looking somewhat newer roerken. Buy steins cheap from Germany? Ha!! it will be taken done shortly….. please disregard even reading it! Even some moderately newer (than the 1600- 1700’s) roerkens can put a pinch on one’s pocket. PLUS VALUE ADDED TAX [VAT] (their version of a sales tax) = this doesn’t applies if item is shipped out of Germany. 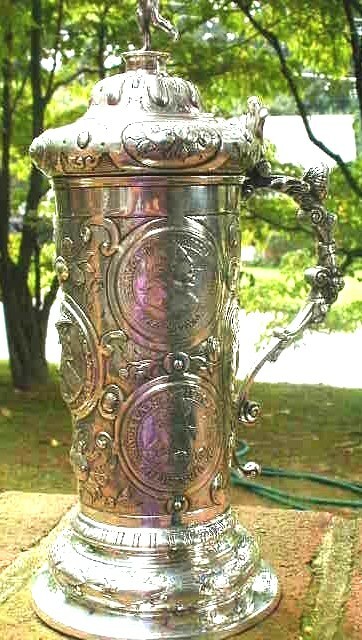 PLUS SHIPPING FROM GERMANY = A MINIMUM OF $30.00 (FOR A MEDIUM SIZED PEWTER STEIN) [+] $254.52, SO TOTAL = $284.52! ROUNDED UP TO $300.00! A Steveonsteins’ lesson: When thinking of buying steins from Europe, double the presale “low estimate” and change that number to dollars. It comes pretty close to the final total cost to buy that piece…… almost always. 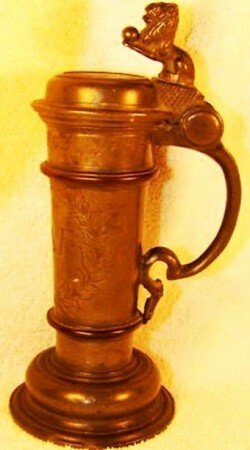 “My first” really antique roerken. What a find! 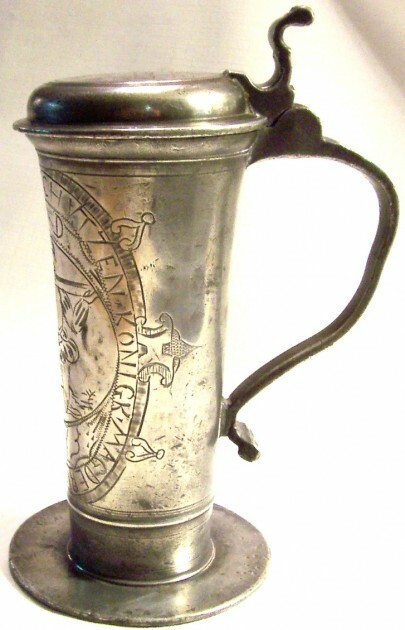 Older pewter Roerkens such as this are “super collectable” in Europe, as are old marksmanship trophies. 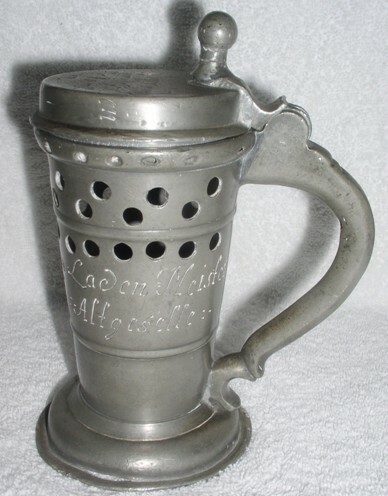 This stein “should” be rated an 8 (Rare) on the Smith-Paratore rarity scale. The lid has a later dated presentation = 1716. The maker’s and Magdaberg city marks. My second roerken. This little guy was offered to me by a fellow SCI’er. I couldn’t get my check book out fast enough! It comes with a recently restored ball thumblift and a small restored split in its base. 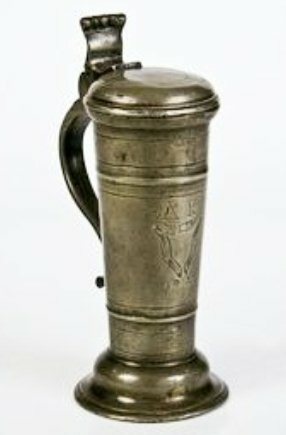 This German pewter “puzzle stein” (“vexerkrug”) [FWTD] It has two engraved names on body, with blacksmith tools and items they made such as horseshoes, locks and keys.6 inches tall and dated 1815. 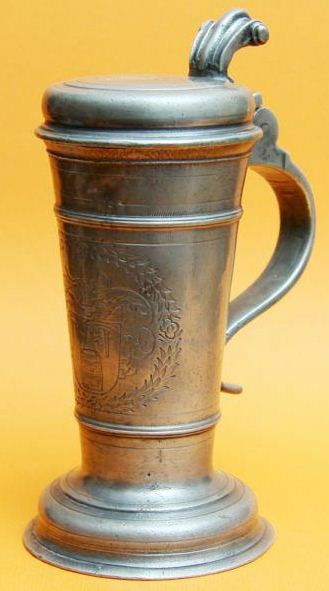 Here is a much nicer example of a “Vexerkrug”, dated 1754. – Sold at a J. Vogt Auction (Munich) in 2002. 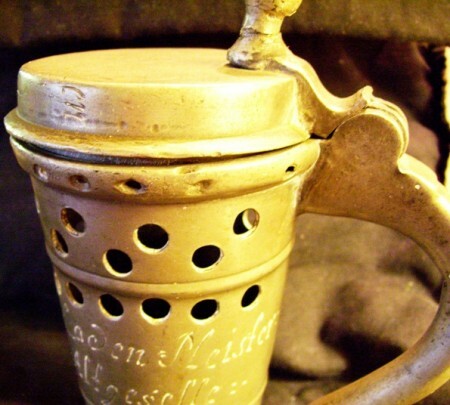 A refresher to the reader; this is the stein shown at the beginning of this article. 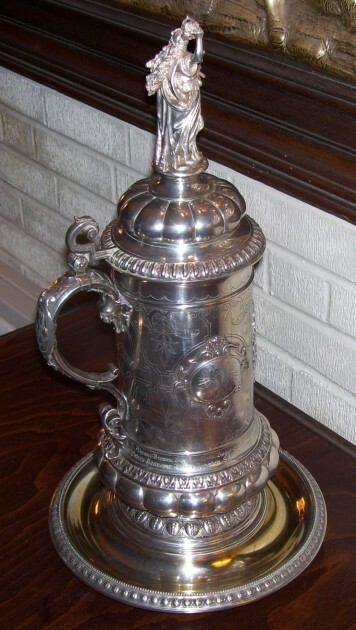 It sold at or about or about $8,500.00! 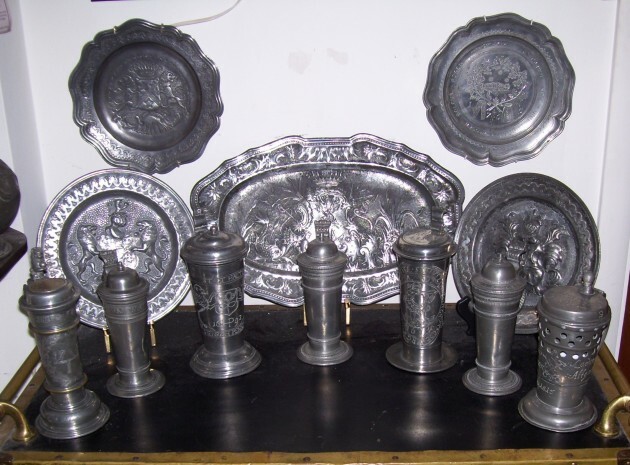 The present pewter “Roerken” collection  in Smith’s Museum and Tavern [FWTD]. All are from the 1600’s, except the far right = 1815. From left: 1, Not dated, but late 1600’s with brass insert in lid, It has a Guild or trade’s mark engraved on the body [unknown which] . 2. 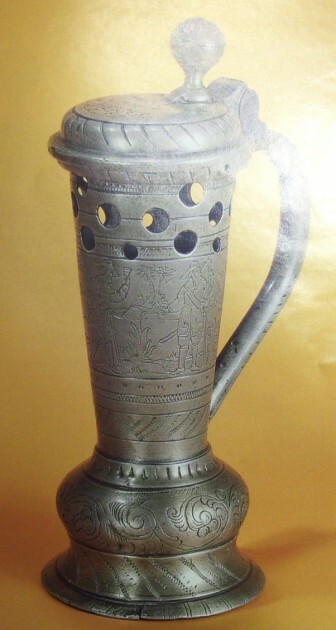 4 , 6 , are Guild steins from an unknown (and not engraved with its symbol as is customary) guild in Rostock, Germany. 1618, 1618, and 1629. All are shown in better detail below: All were purchased off ‘eBay’ over the last four or so years for about 10 -20 percent of what they would probably sell for in Germany. The two smaller plates in the rear of the stand are Spanish, late 1600’s to early 1700’s, and the larger one is French, within the same time period. The two far above are younger. 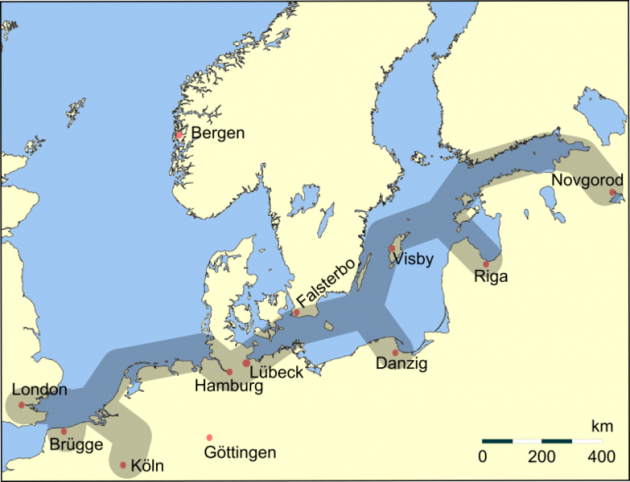 Rostock the city of numbers’ 2, 4, and 5, above is not on this Hanseatic League’s shipping routes’ Baltic / North Sea map, but is located just to the right of Lubeck. Just one of the Hanseatic League Halls, in one German City. AND SO WHY ARE THESE LITTLE GUYS SO COLLECTABLE ? 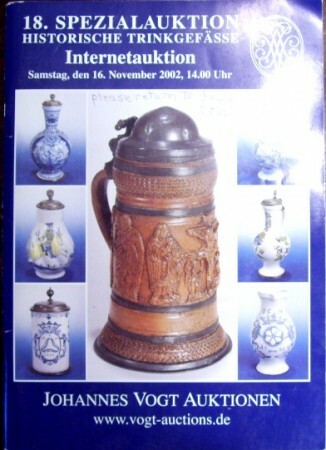 Anything related to the “Hanse” are now highly collectable in Germany and the Baltic States. 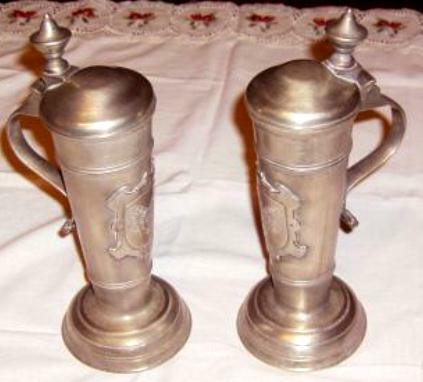 These roerken steins, while made in the early 1600’s are reminders of the better trading days when “The League” made the money for almost all of Northern Europe. My 3rd roerken – From Rostock, German. Dated 1618. It comes with a molded “herring bone” design on both sides of the handle and a flat base. Very solid. All four of these shown on this page are the same size = 7.25 inches tall. 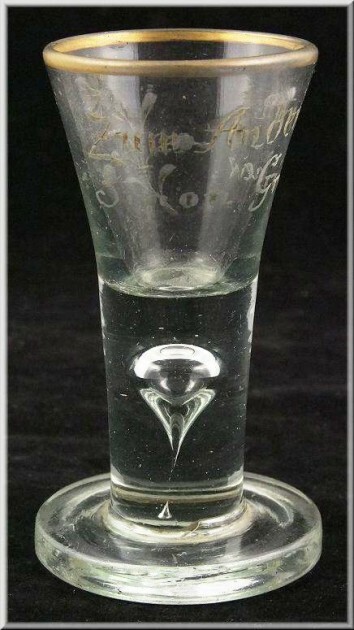 This is from the same Guild as the one that sold in Vogt’s auction, described way above ▲, but in much better condition! 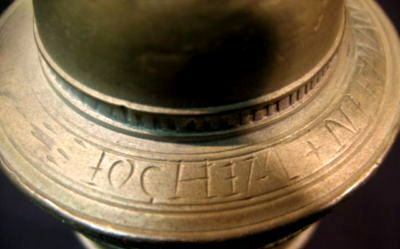 Detail of lid engraved lettering; rather rustic back then. 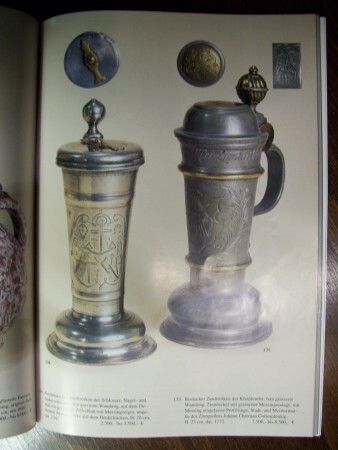 No 4 – The maker’s documentation; of an identical stein, shown top right in a pewter book. 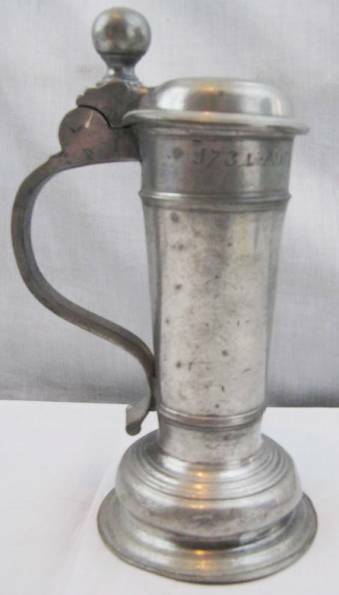 A 20.5 inch tall, .800 silver stein with matching under plate, by Sy and Wagner, the only appointed Silver-smith to the King of Prussia, at that time period.. 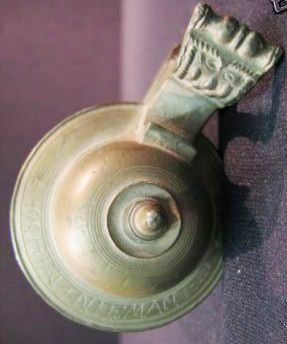 Detail of “Germania” finial and wreathed inscription. 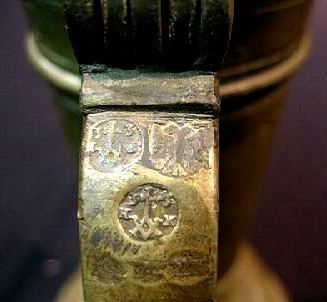 Above ▲ = my 5th roemer, 2nd from the same Rostock Guild also.Dated 1618 as was my 3rd. Herring bone pattern on both sides of the handle! Also check out the eyes of face on the thumblif. 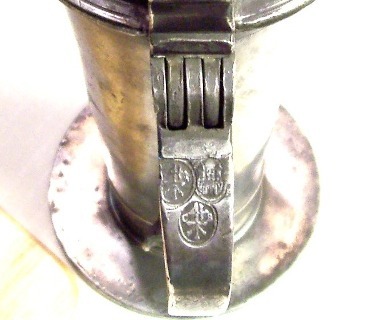 Detail of face on thumblift on “1629” roerken ▲.The 6th. My 7th Roerken started its life in 1692 in the City of Halteren (Westfalen area of Germany.) At 7.75 inches it is the tallest of all so far. 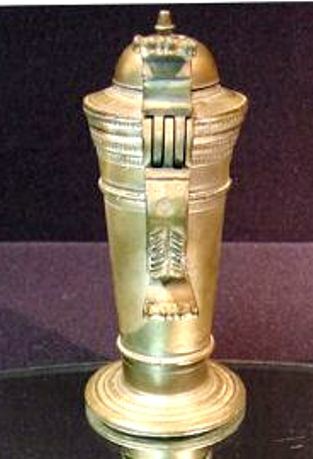 This has an unusual 4 inch wide cone base. The inside of the handle is flat and the outside is a molded floral design going down the entire handle. 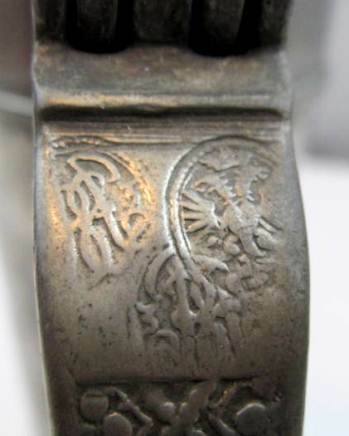 Not the best engraving by an amateur / the owner (? )…..of the City of Haltern’s Ancient Coat of Arms (which shows a “halter” as a ‘canting symbol’ with two lion supporters. 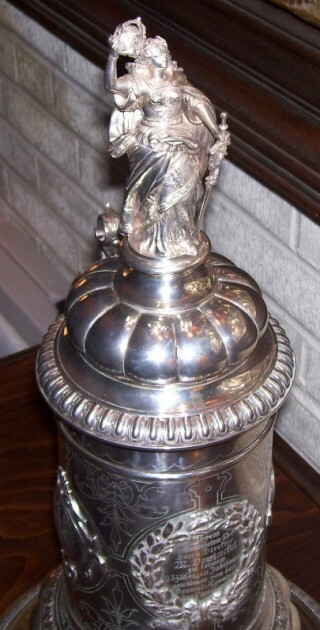 The owner’s name is engraved under the Arms. My last one so fae the 8th ; 4-2011. The eBay ad claimed this was Russian but it is not! It is from Lubeck, Germany, also on the Baltic and also a Hanse City. 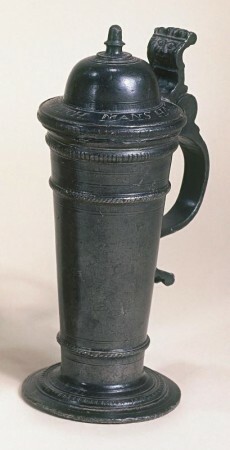 That city’s 1600’s roerkens mostly have this very distinctive style with the two copper bands / ribs attached to the body and the large cupped base and the twisted inward bottom of the handle. 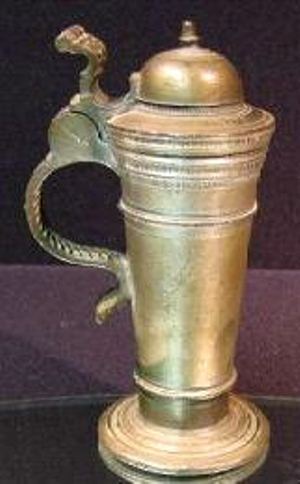 It stands 7.5 inches tall and is very heavy. 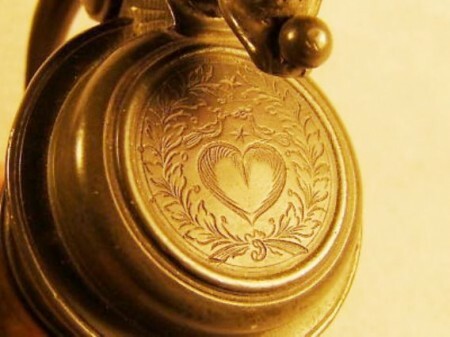 Not a good photo, but this lid has a brass insert with the German LOVE design of the two doves over a heart engraved on it. 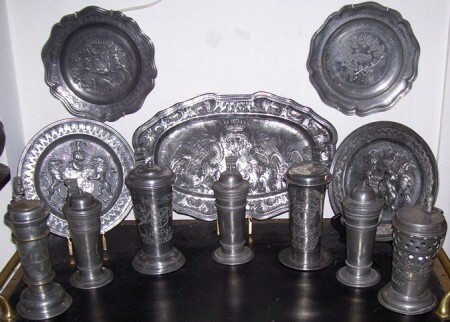 If one looks closely one will see that the two body fillets on the roerken to the right are made of brass. and there is an engraved brass insert in the lid. Probably Lubeck. Below ▼ are a few other interesting Roerken’s I have seen recently selling in Germany! 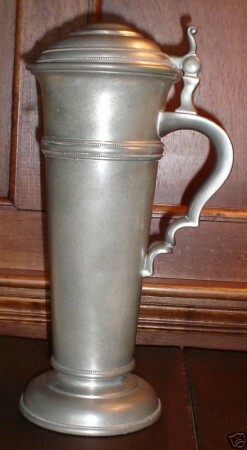 LUBECK “1687” – 8.5 INCHES. $3742 .00 TO START THE BID. 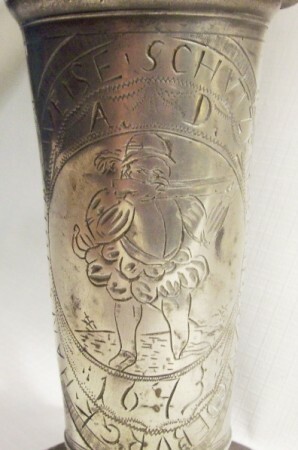 8.8 Inch =Dated 1728. Occupational for a WEBER (WEAVER) – Starting price was 2,300.00 EUROS; at Dr. Fischer’s auction, May 2011. 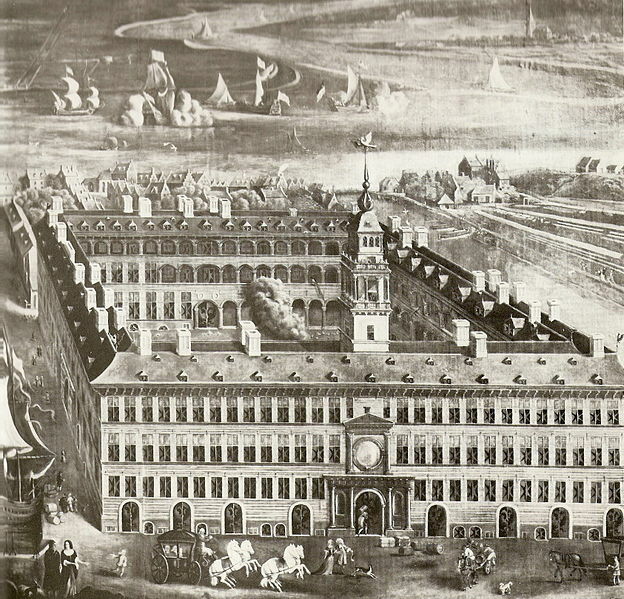 Dated 1677 AND 1734. It was on German eBay, and I think a steal at $2083.00. F. Santesson (Stockholm) copied this style in later years. 9 inches to the top of ball thumblift. It has two non brass fillets and a darkened top section on the body, and I have no idea why!? More photos of above ▲, 1677 & 1734.